NIBS`16 will be held in Oxford, UK, on September 12th - 16th, 2016. The symposium is jointly organized by the Science and Technology Facilities Council (STFC) and the Culham Centre for Fusion Energy (CCFE). The original focus of the symposium, when it began in 1977, as The Symposium on Production and Neutralization of Negative Ions and Beams was on accelerator and fusion applications. The current form of the symposium welcomes contributions on any aspect of the use of negative ions in basic or applied research. NIBS'16 will cover all areas of science and technology related to negative ion production and use. The symposium will present results obtained from experimental investigations as well as theoretical modeling. 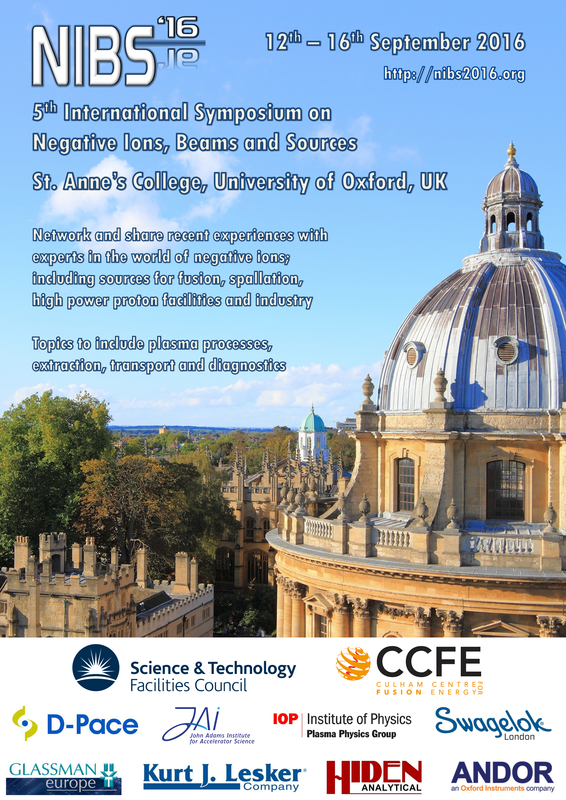 The symposium is also an ideal setting for new researchers to establish contacts and see first-hand the latest developments in the field of negative ion research.